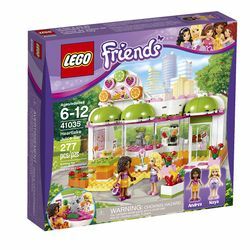 41035 Heartlake Juice Bar is a Friends set released in 2014. This is a description taken from LEGO.com. Please do not modify it. (visit this item's product page) Head down to the Heartlake Juice Bar with Andrea for a delicious smoothie! Facts about "41035 Heartlake Juice Bar"
This page was last edited on 9 January 2016, at 12:59.